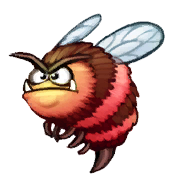 This article is about the bee enemies from Donkey Kong Country: Tropical Freeze. For the turtle-like enemies from the Mario franchise also called Buzzies, see Buzzy Beetle. Buzzies are bee-like enemies debuting in Donkey Kong Country: Tropical Freeze. They have big stubby bodies, ending with a short sting which they use to attack. Similarly, their legs and wings are also thin and small. Buzzies always seem grouchy, given their frowns and squinted eyes. Each Buzzy displays furrowed eyebrows and sharp mandible fangs protruding out the mouth, making them resemble Goombas from the Mario games. Buzzies are naturally encountered patrolling the air. When the Kongs draw near, the enemies start to threatfully pursue the Kongs in an attempt to harm them. On their way to the target, Buzzies fly slowly and in a staggering manner. In Beehive Brawl, a level in Juicy Jungle, some are seen coming out of their beehive houses to attack the Kongs. Some Buzzies, on the other hand, are passive. In the same level, arrays of larger Buzzies march over areas with wide chasms, carrying fruit slices covered with climbing grass, which provide transport over the chasms and help the Kongs advance through the stage. However, due to the added weight, Buzzies steadily descend, unless the Kongs pound their fruit slices, which forces the insects to ascend. Buzzies can be defeated with stomps and roll attacks, as well as barrels. They inhabit the later levels of Juicy Jungle, namely Jelly Jamboree and Beehive Brawl. However, Buzzies are also encountered in Spinning Spines, the temple level of Sea Breeze Cove. Būn From 「ブンブン」 (bunbun), a Japanese onomatopoeia of a buzzing sound. The Buzzy-resembling creatures can be seen in this picture, over a bale of hay, among other species from Autumn Heights. In the game, there is concept artwork for a swarm of small creatures very similar to Buzzies. It is part of the second "Hidden Kong Temple" picture, which can be accessed in the Extras menu after the player collects all five Puzzle Pieces in Bopopolis. They are shown among other creatures that are/would have been found in Autumn Heights. It is unknown why they were excluded from the actual game. This page was last edited on June 26, 2018, at 10:10.